The sadhus campaigned in favour of BJP candidate Uppala Sarada, blessing her and then touring along with her in a van. One of the Naga sadhus said that they had brought the blessings of Kasi Viswanath. No one, not even BJP leaders, knew much about them, even their names. Khammam: Scores of BJP workers are flooding Khammam and Bhadradri-Kothagudem constituencies to campaign for the December 7 elections. 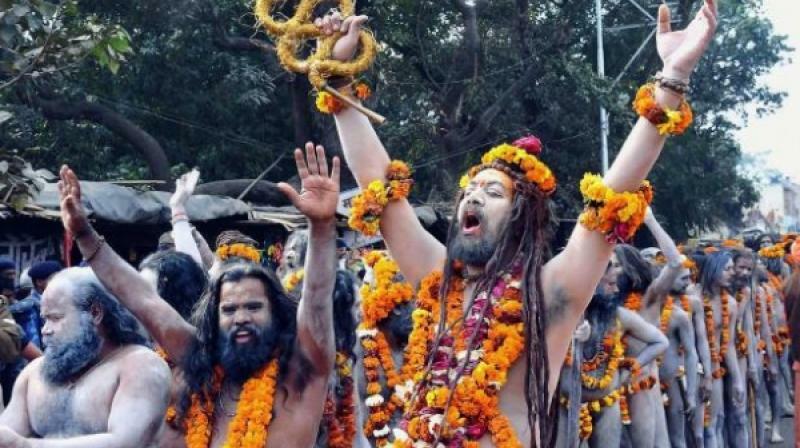 Among the most unique campaigners were four Naga sadhus from Varanasi. One of the Naga sadhus said that they had brought the blessings of Kasi Viswanath. No one, not even BJP leaders, knew much about them, even their names. While the voters were surprised at seeing the Naga sadhus. Ms Sarada said she was fortune that they had come to bless her. At Yellandu, Union minister Jual Oram said the BJP government at the Centre would give pattas to podu farmers. He said the Modi government had introduced various schemes for the welfare of the adivasis and he had constituted a commission for the development of tribals. “About Rs 5,000 crore funds were allocated to the commission and they are being spent for the development of adivasis”, he said, adding that BJP was the only party in India which was committed for the progress of tribals. Mr Jual Oram also said that the BJP was the first party that had adopted resolution in favour of Telangana and the statehood would not have happened without the support of the party.